Shelf Actualization: So You Wanna Be A Writer? 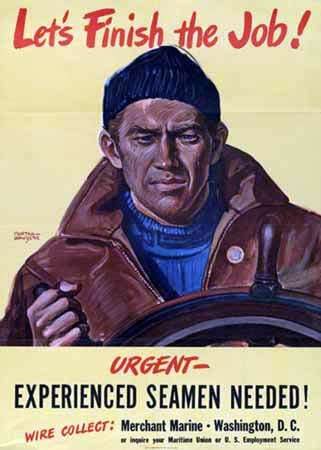 Join the Merchant Marines! So You Wanna Be A Writer? 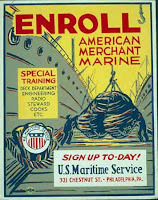 Join the Merchant Marines! Who among us hasn’t felt the urge to chip paint, swab the poop deck, or keep the midnight watch over a commercial shipping vessel at one time or another? Who can honestly say he’s never heard the call of the sea? “He could see the big ships departing, the broad-beamed ferries constantly on the move, the little boats floating far below his feet with the hazy splendor of the sea in the distance and the hope of a stirring life in the world of adventure. So, it’s not all rainbows and butterflies. So what? It still sounds like a nice gig, if you can get it. And the literary merits have been proven time and time again. Like the great authors named above, you could pluck your ideas and experiences from exotic foreign ports and use the long hours at sea to let your material marinate and develop for our benefit. So go ahead. Set sail for literary distinction. 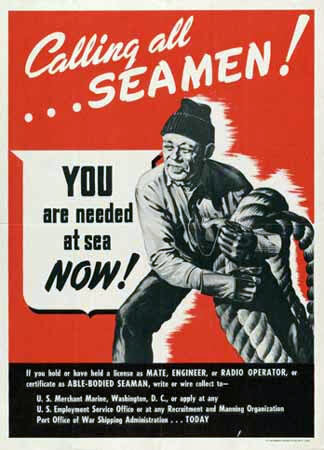 Be a writer, be a merchant marine. Saul Bellow? A jew from Chicago at sea? I had no idea. Speaking of Saul Bellow, I was completely befuddled this last year when I read The Adventures of Augie March, supposedly one of the better novels ever written. I didn't like it all. It was very bland, just detail after boring detail. I LOVED Herzog though. Loved it. It's genius. Can anyone help me with Augie March? 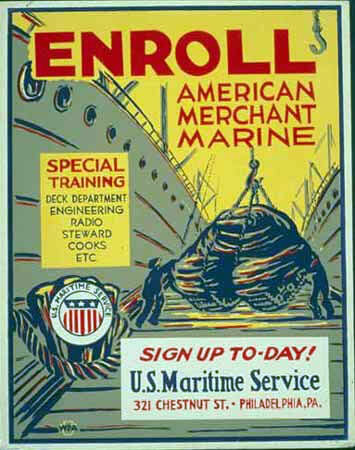 Merchant Marine: it's not just for white, Anglo-Saxon Protestants anymore. Can't help you out with Augie, though. I've yet to read it. While most of the officers were white, most of us unlicensed crew were of different races: Phillipinos, Puerto Ricans, African-Americans, etc. I wish more young people would look into the Merchant Marine before spending money on colleges they can't afford. It is a good way to get real life experience and see some of the world, while earning money. Also, don't forget Mark Twain! Who worked as a pilot, and who's pen name is a reference for...a river depth term that pilots used I think...right? And I don't think Kerouac ever caught a ship unfortunately, although he did try in San Francisco. Did he? Thanks for the comments, Martin. I will definitely check out your documentary. As for Kerouac, I recently read his posthumous novel, "The Sea is My Brother," which wasn't very good but still shed a little light on his very brief stint in the merchant marine.